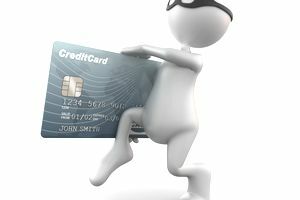 It can be frustrating to have your credit card or debit card stolen. Your wallet or purse can be stolen, giving the thief access to all of your personal account information, or you may be in a situation where your information is stolen online through a hacked database. Either situation is frustrating, and you will need to act as soon as you notice there is something wrong with your account. The first step is to contact your credit card company as soon as you notice that your credit card is missing. You will have a time limit to report this information so that you are not responsible for the charges. Generally, this is within twenty-four hours of noticing that your card is missing. You have a larger window if you find that you have an incorrect or fraudulent charge on your account, since most people will not find the charge without reviewing their statements. You should do this every month to protect yourself. Once you report the loss, the credit card company will cancel your current card and issue you new cards. They may contact you if they think that your information has been compromised, and send you a new card as a precaution. This means that you will have a few days where you do not have access to your credit card account. You may also need to review the charges that come through in the next few days, so they can determine which charges are legitimate, and which ones are not. You should file a police report if your cards were stolen. You will need this report to protect yourself if you have to dispute charges with the credit card companies or different companies. If your identity is stolen as a result of this theft, you will have a report dating back to the time your originally had the theft. You should have several copies of the report. You can use the same report for multiple stolen cards or if you are dealing with identity theft. You will need to submit a copy to the banks, but you should also keep a copy on file for your own records. You may also need to contact your bank, if your checkbook or debit cards were also in your wallet or purse. You will follow nearly the same procedure if your checkbook were stolen. You should monitor all of your accounts to make sure that you do not have any unauthorized activity on the account. You should keep an eye on it for several weeks, because thieves may wait to access your account. Another important step is to change all of the automatic payments that you have tied to that credit card. If you have the information stored at online stores, you will want to change it there and take it off. This will prevent you from receiving late payment notices. It can take time to complete the step, but it is important to do it. You may want to make a list of bills that are automatically debited, and the accounts you pay with, so you can make the changes quickly. Do not put your account numbers on this list, just label them with the bank name or card information. If you have your credit card number or bank information stolen, you will need to monitor your credit over the next several months. You should check your credit report to make sure that no one has opened accounts under your name. You can do this for free through the three major credit agencies. If you spread it out, you can check at one agency every four months, which makes it easier to keep an eye on your credit. If you find an unauthorized account, you will need to report it as identity theft and contact the bank that opened the account. This can take several months to fix, so you will need to be patient. The most important thing you can do is to pay close attention to your accounts and credit report.